This is such a gorgeous burgundy. It applies perfectly in one coat and it stamps very well. If you're a fan of OPI Every Month Is Oktoberfest, you should check this one out. 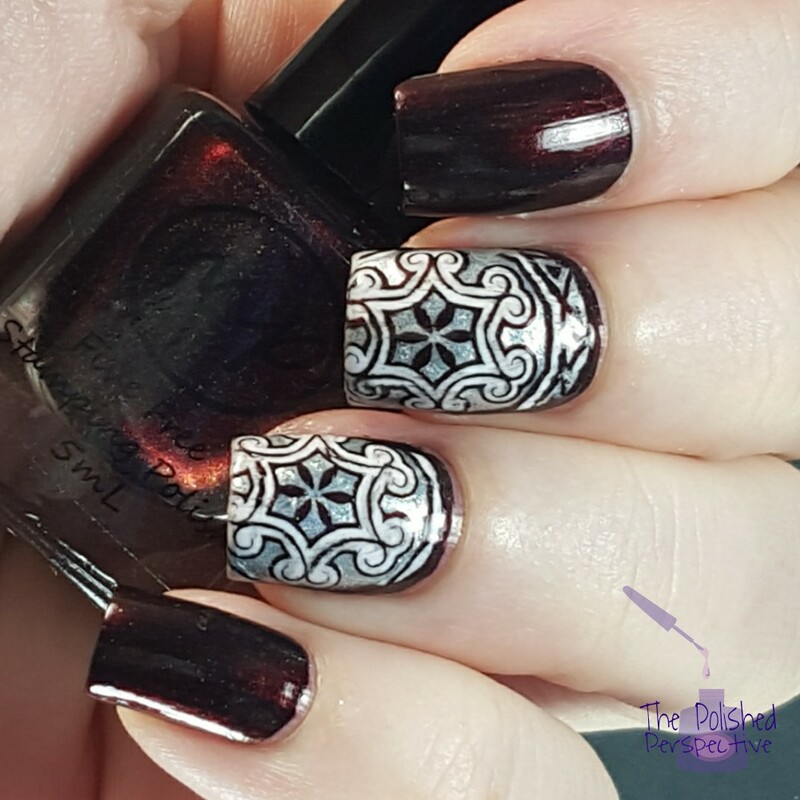 For this mani, I used You Are My Symphony as the main color and stamping color. On my middle and ring fingers, I used Essie Apres-Chic and Essie Peak Show to fill in the decal image. Both Essies are from the Essie Virgin Snow, Winter 2015 collection that I reviewed at this link. The image is from the Pueen Cosmetics Make Your Day Collection. This polish is a custom nail polish made in collaboration with Pish Posh Polish to benefit a young man named Kent. Kent is 16-year-old young man that had an unexplained stroke October 9, 2015 while at school. The stroke effected 1/3 of his left lobe impairing his movements and language. You can find out more about this young man and his journey at the Kent Hill Update Facebook page. 50% of the proceeds of this polish will be donated to his Go Fund Me account. M Polish You Are My Symphony is a Limited Edition polish that can be found at mpolishes.com. This nail polish/stamping polish retails for $10.50 for a full size (15mL) and $4.25 for a mini size (5mL). Pueen Cosmetics Make Your Day Collection can be purchased through their website or on Amazon (direct link below). The Essie Virgin Snow collection nail polishes can be purchased at Ulta, Beauty Brands and other retailers. This a beautiful polish! I've been following Kent's story and I'm so happy for his progress so far. Big ups to Pish and Megan doing what they can to raise awareness and help! Agreed. Pish and Megan are good people. This mani is incredible! I just got You're my Symphony on Friday, can't wait to use it! What a wonderfully vampy color! Such an awesome cause, I absolutely love the stamped images you did with this! This is beautiful!! The stamping is sooo crisp! This mani is gorgeous! I just got this polish in the mail today, too.